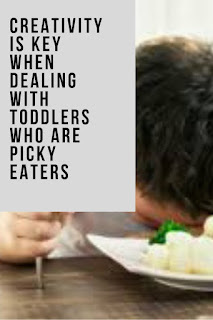 It’s not news that toddlers can be picky, fussy, finicky eaters. The fact of the matter is—it is normal for them to be so. But before you throw your arms up in the air the next time you encounter such resistance to your efforts to feed your child, you might want to know there are ways to get around this problem. The first and the most obvious available to you is human physiology. Our bodies need sustenance; and try as we might not to eat, our bodies will always cause us to become hungry. This law of physiology also applies to your toddler. However, starving a child to the point that it will eat anything you give it would indeed seem a bit too cruel. It is understandably not a good method for parents to resort to, no matter how desperate they may become to get their child to eat. What parents need to be when faced with a fussy toddler who refuses to eat or chooses to eat only a certain kind of food is not to become desperate. Instead, they must become creative. Creativity is key. And what’s surprising about it is parents don’t have to be told that. They already know this is the way to make children eat. Children are wonderful creatures who are still discovering the world around them through their senses. And one sense they make use a lot of is their sense of sight. This gem of information means children like to look at shapes and colors. And parents should take advantage of this. Come next meal time, prepare food that incorporates green, yellow and red colors. Children respond to colors, especially the bright cheerful ones. This will make their mealtime very pleasing to them. Sample foods to use, which are loaded with the proper nutrients needed by the child, are vegetables like carrots and broccoli, and cheese sticks for calcium. The choices are limitless, actually. Let your creativity reign here. If you can use color to make your toddler’s eating experience fun, you can also use it to set up his mood to eat. Using colors to make people want to eat is the secret of fast food restaurants. Red and orange stimulate hunger, and that is why fast food companies make use of them heavily as colors for their tables or chairs, and display boards, and packages. But while you’re at it, please avoid the color blue. Blue suppresses hunger. Have several cookie cutters of various shapes around. Cut fun shapes out of boring vegetables and other foods. It will make your toddler enjoy meal time very much. Take your child to the grocery and let him help you pick the ingredients for his next meal. This fun activity should also continue at home where you make him assist you in the food preparation. Even if you just let your child observe, seeing how you transform the food he helped you pick out into his meal would add some excitement to eating experience. And there you go. Making meal time fun time for your toddler is really up to your imagination. The possibilities for fun meals are limitless. Chris Thompson is the creator of “Talking to Toddlers”, an audio course for parents. He teaches parents how to overcome the normal problems that every Mom and Dad face with kids by learning better communication skills. Make sure you claim your free parenting audio lesson.